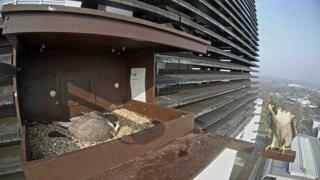 A pair of birds has produced three eggs at the nest at BT’s Adastral Park site at Martlesham, Suffolk. “Based on observations from the last six years it was expected the pair would move on from Adastral around February,” said Peter Merchant, peregrine expert at the trust. “We decided to try and tempt them to stay by providing a nesting site and it worked. “It’s so amazing these eggs were laid just a few yards from where work was going on commissioning the site’s air conditioning units on top of the tower,” said Mr Merchant. Lisa Perkins, Adastral Park Director, said: “It’s fantastic to have these amazing birds living with us.